Snow piles up outside Jefferson Station in Center City, which was closed Saturday, Jan. 23, 2016. 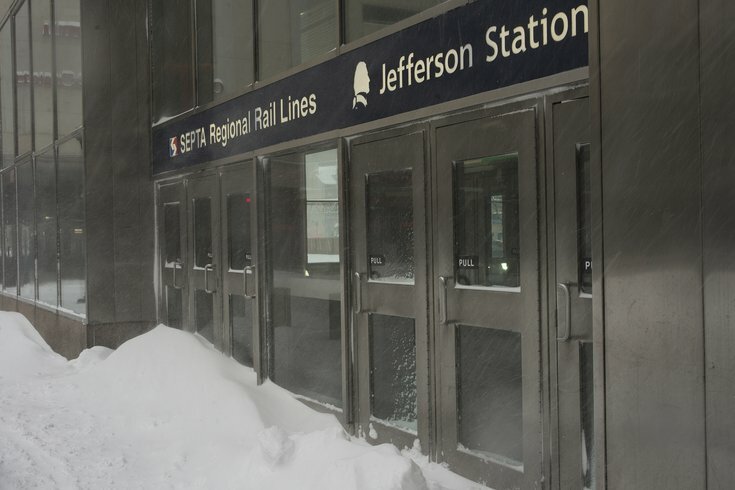 SEPTA suspended all of its Regional Rail service due to the blizzard, but officials expect those lines will be up and running – likely with delays – in time for Monday's commute. SEPTA says it is working to restore bus, trolley and Regional Rail service suspended since 4 a.m. Saturday. The transit agency, which had planned to restart those services at 4 a.m., said it wouldn't be ready until 10 a.m., or longer for certain routes and lines. “There are number of challenges resulting from the storm, which has delivered snowfall totals that exceeded forecasted amounts,” SEPTA General Manager Jeffrey D. Knueppel said late Saturday night in a statement.“The storm’s high winds are creating significant snow drifts that are covering track areas, impacting the operation of third rail power, switches and other key equipment. • Market Frankford and Broad Street Lines: Service has been running on or close to normal schedules, and is expected to continue overnight and into Sunday. • City trolleys: Service is expected to resume Sunday morning. Customers should expect delays. • Suburban trolleys: Service is expected to run Sunday morning on the Route 101 Trolley, between 69th Street and Media. The Route 102 is expected to return later on Sunday. • Norristown High-Speed Line: Snow-clearing operations with a jet engine are continuing tonight between 69th Street and Bryn Mawr. Once cleared, the operation move to the remaining portion of the line. A more detailed update will be provided at 8 a.m. Sunday. • Bus: Service will be restored on a route-by-route basis starting 10 a.m. Sunday morning, with a focus on priority routes that feed customers to the Broad Street and Market-Frankford Lines. Priority city routes include 14, 18, 21, 33, 42, 52, 56, 58, 59, 60, and 66. Priority suburban routes include 93, 99, 104, 108, 109, 110, 113, 124 and 125. Detours are likely where service is running. For route-specific details, visit the System Status section on the SEPTA website. • Regional Rail: High winds, and resulting snow drifts, have resulted in problems with switches on both SEPTA and Amtrak lines. Service restoration will be based on conditions as we move through tonight and into the morning. An update will be provided Sunday morning. • CCT Paratransit: Service will continue for dialysis patients only. • Parking: Parking spaces will be limited throughout the system as plowing continues. Snow removal efforts will run at night all next week, with snow being trucked out of many lots. For the latest updates, customers should visit www.septa.org, the @SEPTA Twitter and monitor local news for information SEPTA’s service. The SEPTA Customer Service Call Center at (215) 580-7800 will open at 7 a.m. Sunday, and will be staffed with extra personnel. In addition, the SEPTA Social Media Team (@SEPTA_Social) will also be available to answer inquiries via Twitter starting at 7 a.m.